If your pet cannot walk today, but could walk yesterday or last week, he or she has spinal cord injury. By far, the most common cause of spinal cord injury in dogs is Intervertebral Disc Disease (IVDD). If your pet has acute spinal cord injury, the nerves within the spinal cord are dying, and the nerves that survive will be the ones that are used to re-teach your pet to walk. The most common form of therapy is conservative therapy, which allows the nerves that are going to die, to die and the nerves going to live, to live. Conservative therapy includes cage rest and anti-inflammatory medications. Conservative therapy results in about 50% of the pets with spinal cord injury, secondary to IVDD, to regain functional status. Functional status means they can walk or wobble-walk and that they have acceptable control of bowel and bladder function. However, many dogs receiving conservative treatments often progress to full paralysis, or require surgery. If your pet cannot walk, do not wait to see if conservative therapy will work, as dead neurons do not regrow. Symptoms can include pain or weakness in the rear legs, sensitive to touch, arching its back, holding its head up in a stiff position, muscle spasms of the back or neck, reduced activity, loss of bowel or bladder control, and paralysis. Breeds susceptible to Spinal Cord Injury are Chondrodystrophic dogs (dogs with hereditary dwarfism), including the Bassett Hound, Beagle, Bulldog, Corgi, Dachshund, French Bulldog, Lhasa Apso, Pekinese, Poodle, Pug and Shih Tzu. Non-Chondrodystrophic breeds include the Doberman Pinscher, German Shepherd and Labrador Retriever. Overweight dogs are at a higher risk of herniated discs, which can injure the spinal cord. IVDD causes compression damage of the spinal cord. Surgical decompression of the affected area within 24 to 48 hours has been shown to improve the case outcome to over 90%. The problem is having access to surgery, which means having physical access to a surgeon, as well as access to nearly $10,000 in funds. Unfortunately, most pet owners do not have this access and, therefore, they are forced to accept the results of conservative therapy. Stem cell therapy can offer another solution, because stem cells spare nerves from death. Death to the spinal cord nerves is due to compression from the disc and resultant damaging factors, all of which are reduced or eliminated by stem cell therapy. Activation of astrocytes Astrocytes form scar tissue that blocks nerve healing. Stem cell therapy blocks astrocyte activation. As mentioned above, if your pet cannot walk, do not wait to see if conservative therapy will work, as dead neurons do not regrow. If your pet cannot walk, there is nerve damage, and if there is nerve damage, stem cells will help. Even if your pet does get surgery, stem cell therapy combined with surgery doubles the surgical outcomes. If you cannot afford MRI and surgery, then you should consider stem cell therapy alone to help spare your pet’s neurons from this fate. If your pet has had a recent MRI and it is available, it may be acceptable by Safari. Stem cells placed into the spinal fluid space by injection will “home” in to areas of inflammation and compression and will start immediately to reduce the number of dead or dying neurons. Injections administered directly into the affected area of the discs and/or the spinal canal are more accurately placed and even more effective. Stem cells can be modified prior to placement to produce growth factors and to promote neuron development and growth. Stem cells placed into damaged spinal cords have been shown to produce neural relays between damaged neurons that conduct nerve impulses around damaged areas of the spinal cord. Treating the intervertebral discs with stem cells can not only treat the existing disease, it can prevent disc herniation as well. Nucleus Pulposus. 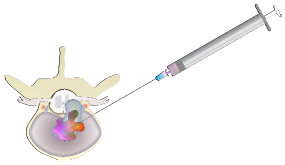 Injection into disc with Stem Cells. 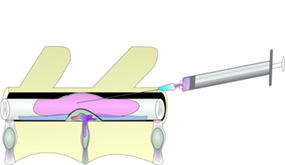 Injection into spinal cord with Stem Cells. Physical rehabilitation will be needed for bringing the stem cell treatment the full circle of success. 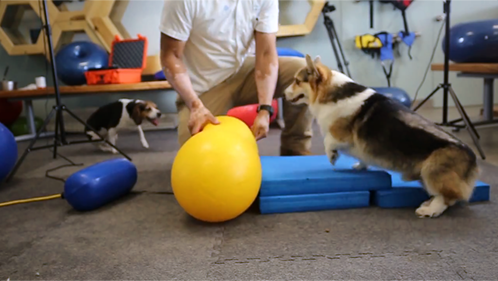 Safari’s Certified Canine Rehabilitation Specialists are armed with comprehensive rehabilitation tools and modalities to match the needs of your pet with the best physiotherapy regime. You may, optionally, elect to locate a specialist in your area if travel distance is an issue.